Today was Day #2 of Chocolate and Berry Theme Week. I've been working my way through a variety of chocolates from John and Kira's (Philadelphia, PA). Today's Glenn's Strawberry chocolate*, came from the company's "Every Flavor" assortment box. 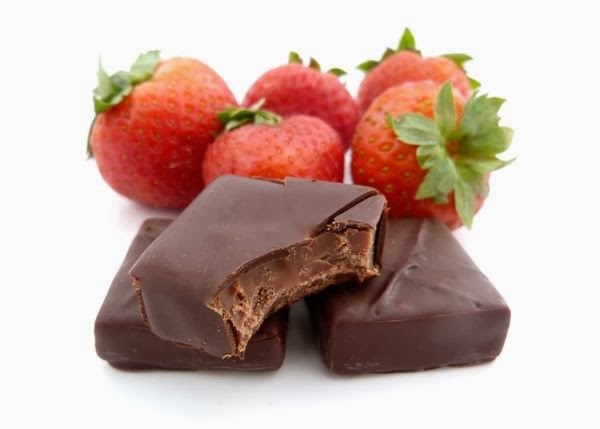 The strawberries, from Glenn Brendle's Green Meadow Farm (in Gap, Pennsylvania), were blended with Valrhona milk chocolate to make a creamy chocolate ganache (filling) infused with just the right amount of fresh, right-off-the-bush strawberry flavor. Note: I also sampled John and Kira's Glenn's Raspberry chocolate, and I hope to include this one in a future post.